M63 was photographed during the “Achterhoek weekend” March 2014. Like all globular clusters, M13 contains a dense population of thousands of stars, which are kept together bij strong gravitational forces. 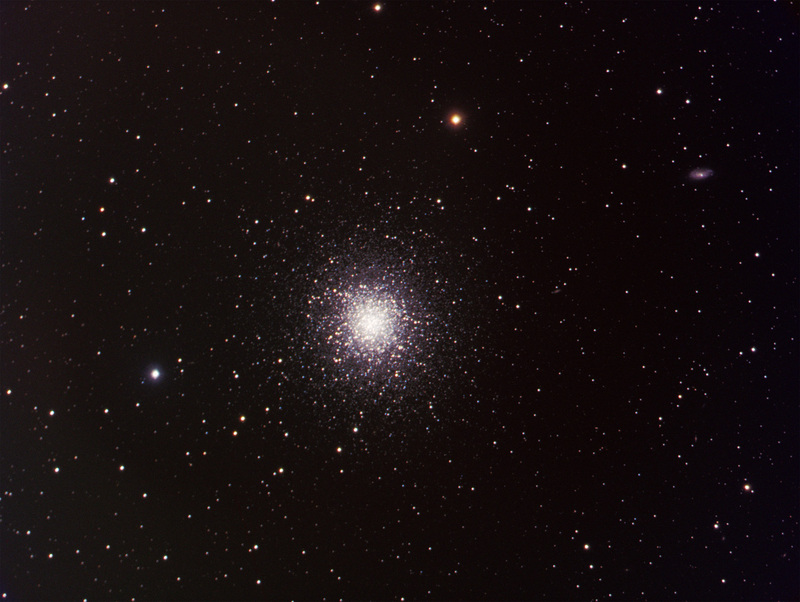 Globular clusters are orbiting around the gallactic core of the Milky-way. 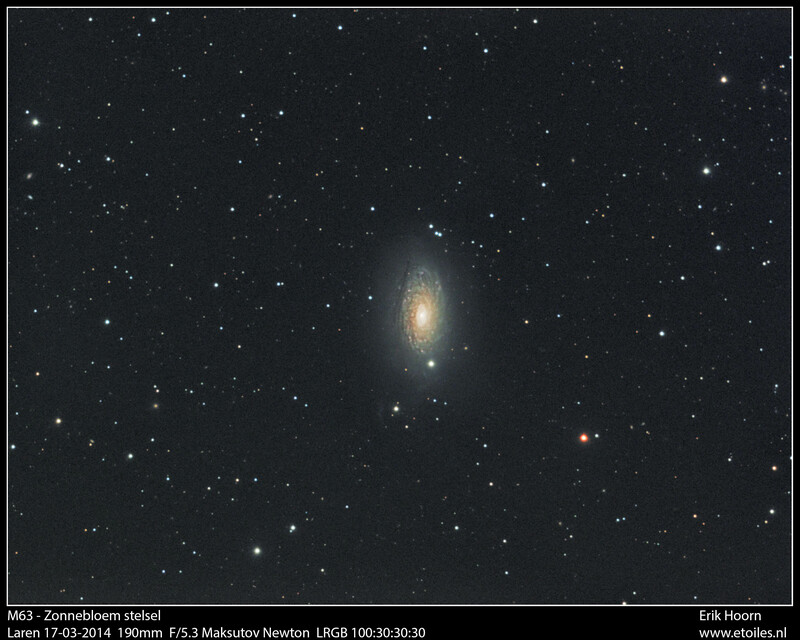 The image was made in August 2013 at “De Wassenaarse Slag”, with a Skywatcher Maksotov Newton 190mm f/5.3. 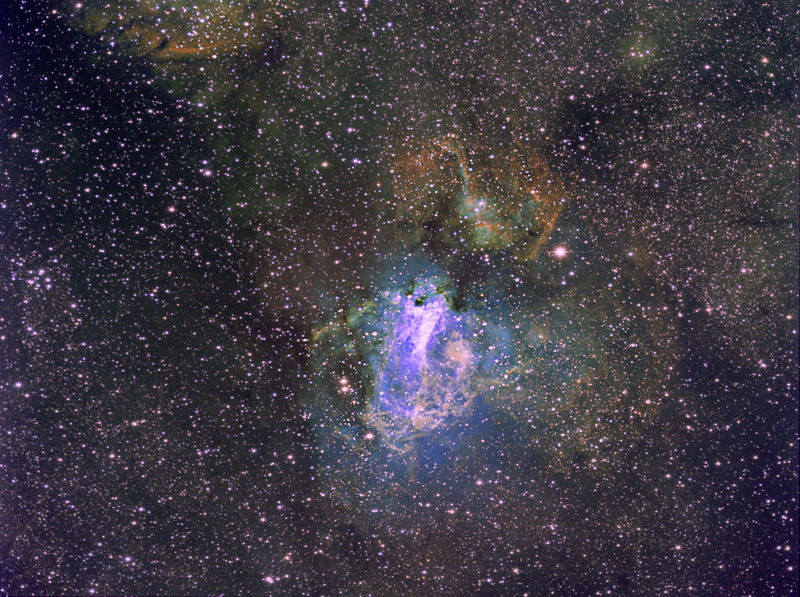 M17 catched with a C9.25 – Hyperstar III configuration, each of the Ha SII OIII channels is composed of 4 subs with an exposure time of 12 minutes each. Qsi wsg583 camera, Cooled CCD -15 degrees Centigrade. 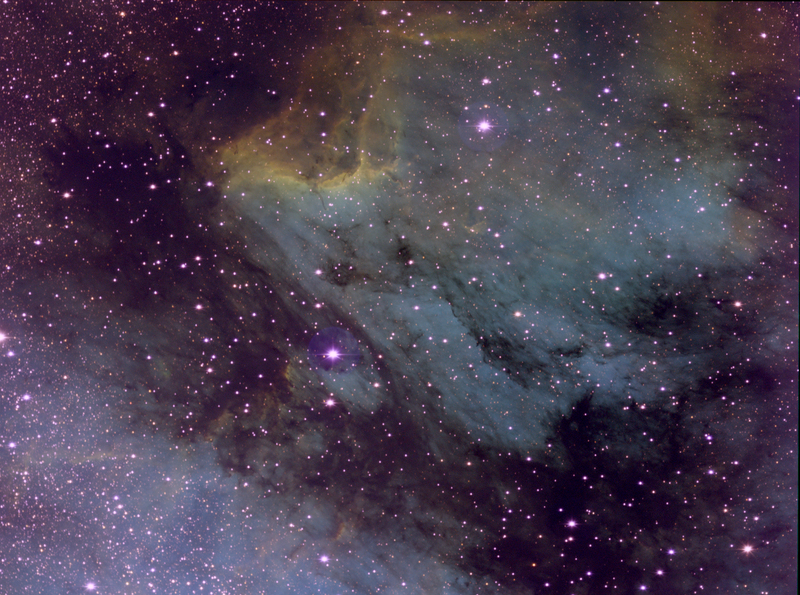 This image is made with a C9.25 – Hyperstar III setup and a QSI wsg583 camera. The SII, Ha, and OIII frequencies are depicted on RGB channels. Per channel 8 subs were used, with an exposure time of 12 minutes per sub. Due to the short flange focal distance, the usage of the “G” cover with pick-up prism of the QSI camera was not viable. Instead a seperate guidings scope f=200 was used with a Lodestar Guiding cam. Location was camping Les Matherons at Puimichel, june 2013. 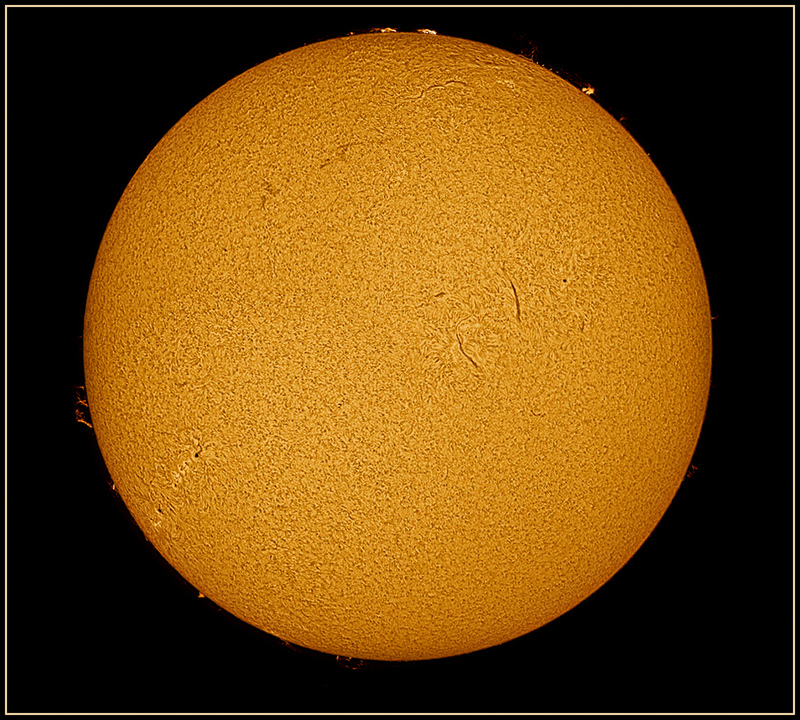 In 2013 there is a lot of solar activity can be expected. Very clearly an enormous Quiet Region Filament (QRF) can be seen. Both images were taken with a Lunt 60mm pressure tuned, single stack telescope using a DMK31 camera. The bottom image required an additional Meade/Robtics 3x apochromatic Barlow, but is unfortunately not in focus. 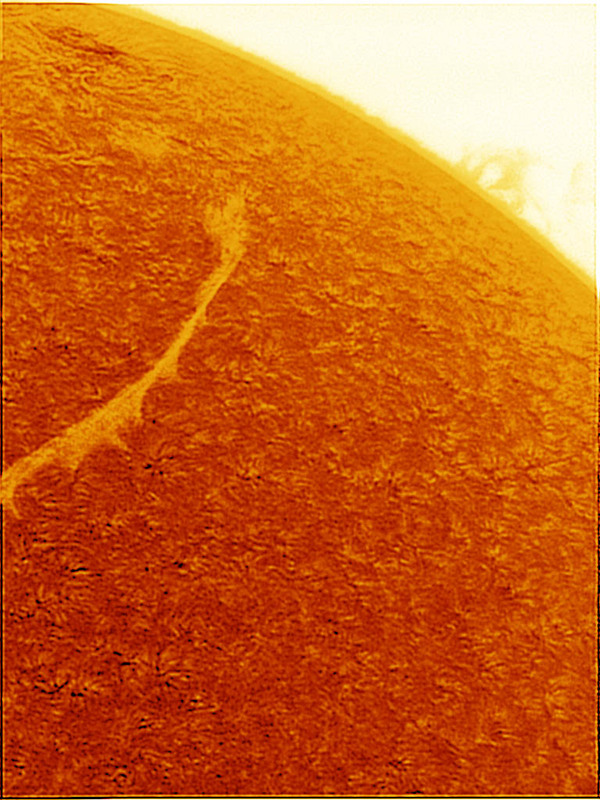 The images were aligned and stacked by means of Registax, using the best 20% of 1000 frames. By means of Astrasoft image processing software, a Lucy Richardson / Moffat deconvolution filter was applied. Finally high pass filtering applied: Created two copies of the original layer: layer 1: highpass filter r=7 pixels, mode= overlay, luminosity 30%; layer 2: higpass filter r= 40 pixels, mode= soft light, luminosity = 30%. 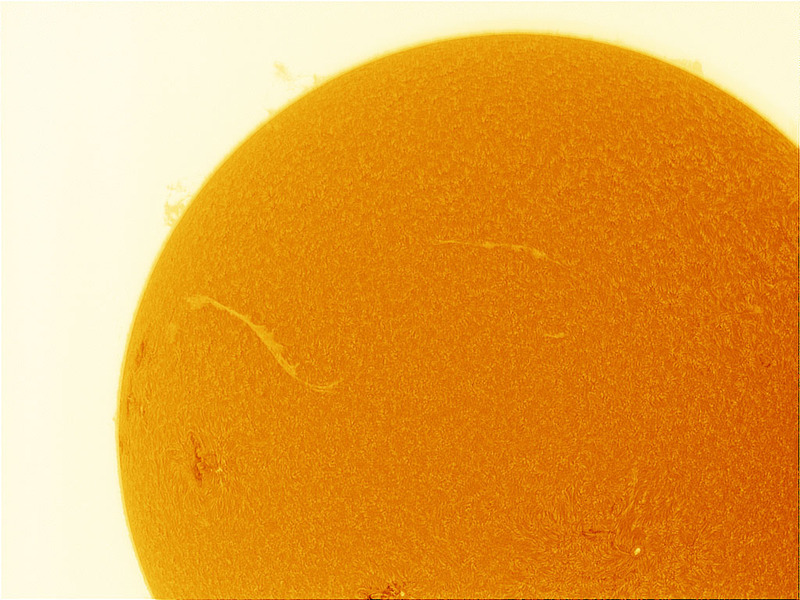 This picture of the Sun in the light of ionised Hydrogen. Passing through H-alpha light (656,28 nm) only exposes granulation and several protuberanses. Due to the extreme narrow bandwidth (0,7 nm or less) which is required to observe the smallest details, an Etalon filter is used in combination with a blocking filter. 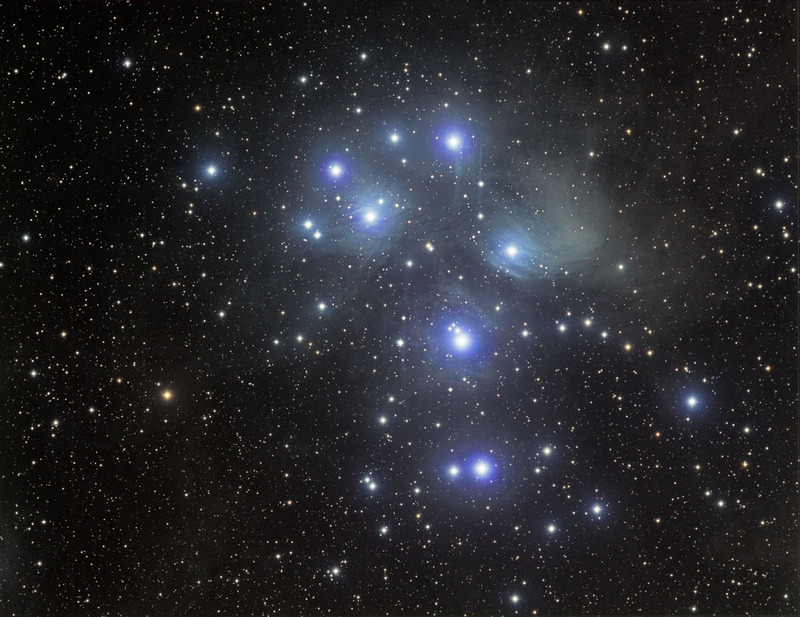 The Pleiades or “Seven Sisters” or in Dutch: “Zevengesternte” is an open starcluster, composed of 7 hot B-type stars. The nebulosity is caused by an unrelated dust cloud in the interstellar medium where the cluster is moving through. This picture is taken at Grandpre (Northern France) at a starparty organised by Sterrenwacht Rijswijk. A very small 65mm f/6.5 apochromatic telescope has been used, whilst the CCD sensor was cooled only at 0 degrees Centigrade due to the moist conditions. The Markarians chain is named after the Armenian astrophysiscist B.E. 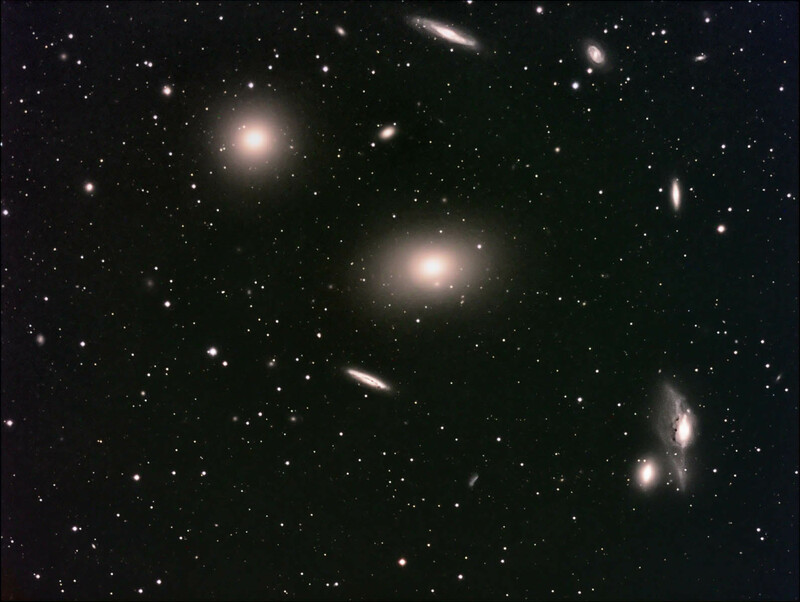 Markarian who found out that the galaxy NGC4406 is moving at a speed of 1100 km/s towards earth, whilst the other galaxies move away with a speed of 700 km/s. Gravitational forces influence both position and movement of the composing galaxies. 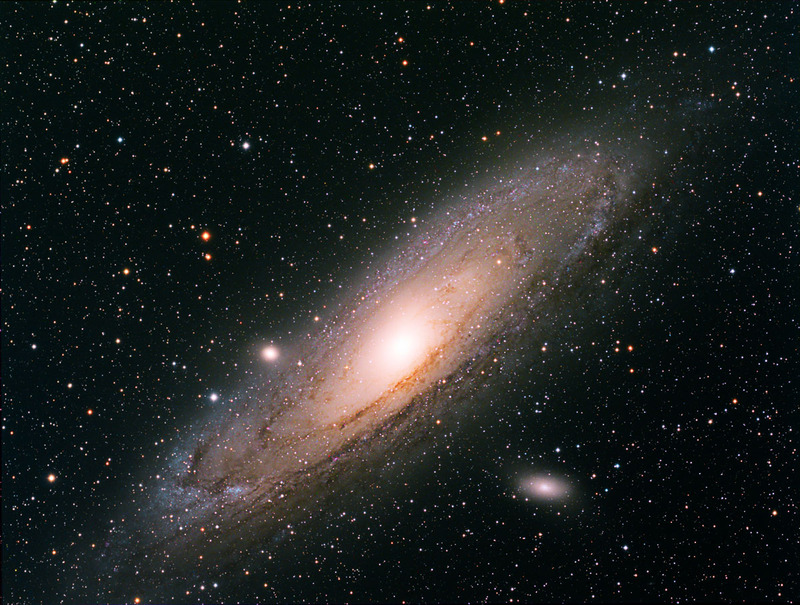 The Andromeda Galaxy is the nearest Galaxy to our Milky Way Galaxy, being a part of the local group. With a speed of 110..140 km/s it is approaching our Galaxy, and is one of the rare galaxies at which a blue shifted spectrum can be observed. It contains one trillion stars (10^12) whereas the Milky way contains “only” 200…400 billion stars. This picture is taken at a starparty organised by “Sterrenwacht Rijswijk” with a very small telescope (65 mm f/6.5 and a cooled QSI wsg583 camera. Due to the moist conditions in Grandpre in september 2012, the CCD temperature was limited to 0 degrees centigrade. 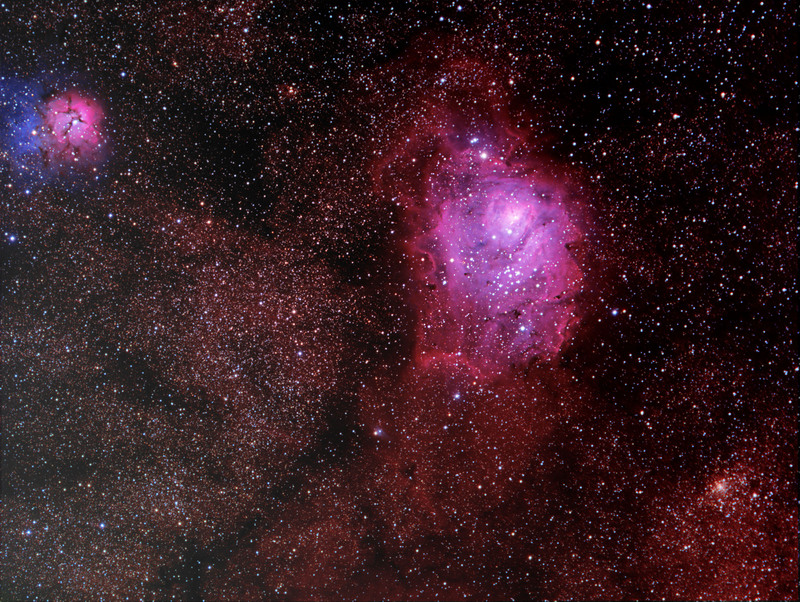 The overwhelming star region Saggitarius contains the Trifid- and the Lagoon nebulae. The Trifid (Trifid = Divided into three parts) nebula is composed of an emission nebula (red portion), a reflection nebula (the blue portion) and a dark nebula (the dark gaps). Star formation between the dust- and gas lanes takes place. The distance is approximately 5200 light years. The Lagoon nebula is about 7000 light years away, and was discovered in 1747 by Claude Gentil. It is very faintly visible by the naked eye as a cloudy patch.